As there was little official unification in pugilism during the period, there was often disagreement over who was the champion which makes a definitive list impossible. That said, these fighters are generally accepted by sports historians to be the bare knuckle boxing champions of the 19th century. Prior to the introduction of the famous Queensbury Rules in 1867, it can be argued that pugilism was a much more dangerous sport. The number of rounds in a contest was limitless and they would continue until someone was knocked down or unable to fight on. 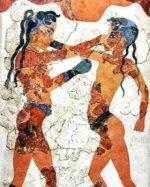 Wrestling moves were common during this era as was holding and while boxing gloves were used for training purposes, most boxing contests were fought bare knuckled. Jem Mace, regarded as one of the best boxers of all time, was also one of its most important ambassadors. He used his worldwide fame to help gain acceptance for the new Queensbury Rules which emphasised the wellbeing of the fighters and made boxing recognisable as the sport we know today. He also pioneered new methods of crowd control at fights, limiting the outbreak of riots that were common place during the period. He championed new payment methods for fighters, putting an end to the winner takes all systems allowing both contestants to get paid for the work they put in. But perhaps the most important legacy of Jem Mace’s career was his stance on equality. 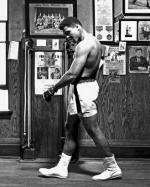 He was one of the few white people in his time fighting for the rights of black boxers and it was largely down to his efforts that there were opportunities for non-whites in boxing long before most other sports. Jem Belcher (1800 – 1803) – The first champion of the 19th century was a talented young fighter called Jem Belcher. Grandson of the infamous Jack Slack, Belcher held the title for three years before being forced to retire after losing sight in one eye playing rackets. Hen Pearce (1804 – 1806) – Known as the Game Chicken as a result of his legendary courage, Pearce was forced to retire early when a turbulent marriage forced him to drink. John Gully (1807 – 1808) – Gully lost to Hen Pearce after six rounds after the latter bought the former out of debtor’s jail so that the two could fight. Despite losing, he was classed as the champion after Pearce’s retirement. Tom Cribb (1809 – 1822) – Seen by many as the greatest fighter of his time, Cribb held the title for a number of years before retiring to run a London pub. 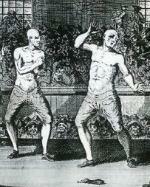 His two most famous fights were against Tom Molineaux, (depicted above is their second fight in 1811). Molineaux was an ex-slave and formidable fighter who was the first American to challenge for the title, though he was defeated by Cribb on both occasions. Tom Spring (1823 – 1824) – Spring was a student of Tom Cribb and retired after one year as champion, despite having several victories (and one loss) in that time. Tom Cannon (1824 – 1825) – Claimed the vacant title after Tom Spring’s retirement and lost it a year later in an epic show down with Jem Ward. Jem Ward (1825 – 1832) – The Black Diamond as he was known lost the title to Peter Crawley in 1827, who retired immediately after allowing Ward to keep the title. He toured the USA for a while before retiring in 1832. James Burke (1833 – 1839) – Known for his devastating punch and nicknamed the Deaf ‘un because he was hearing impaired, his opponent for the vacant title, Simon Ward, died because of injuries sustained during their fight. William Thompson (1839 – 1840) – Known as Bendigo, Thompson was a gangster whose friends would often intimidate his opponents. Soon after beating James Burke, he retired leaving the former champion Burke and Ben Caunt both claiming the title. Nick Ward (1841) – The younger brother of former champion Jem, Nick fought both of the main contenders, James Burke and Ben Caunt, beating both men on a foul decision. Ben Caunt (1841 – 1845) – Beat Nick Ward in a rematch to gain the title and would go on to lose it to former champion William Bendigo Thompson, who beat him for the third time to regain his title. After a gruelling ninety-three rounds, Caunt was disqualified for going down without getting hit. Afterwards he retired from the ring. William Thompson (1845 – 1850) – Though he held the title for five years after coming out of retirement, Bendigo would only defend it once in a fight he won after his opponent, Tom Paddock, was disqualified for hitting him when he was down. After his second retirement he became an evangelist preacher and had the distinctions of having a race horse named after him, a town in Australia also took his name and he was the subject of a poem by Sir Arthur Conan Doyle. William Perry (1850 – 1851) – Known as the Tipton Slasher, Perry won the vacant title by beating Tom Paddock and lost it a year later to Harry Broome; both fights were decided on a foul. Harry Broom (1851 – 1856) – Broome forfeited the bare knuckle boxing title because he refused to give a rematch to William Parry, whom he had beaten on a foul. Tom Paddock (1856 – 1858) – After losing title bids to William Thompson and William Parry, Paddock finally achieved his dream and became the champion. 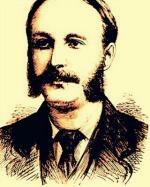 Tom Sayers (1858 – 1860) – Gained the title by beating the veteran Tom Paddock. Sayers (pictured below on the left) weighed in at only 11st so was used to beating much heavier men than himself. 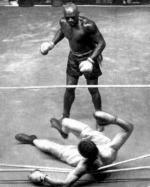 After a gruelling draw with American John C Heenan in which he fought many of the forty-two rounds with a badly injured arm, Sayers retired from boxing. Sam Hurst (1860 – 1861) – Another fighter to beat Tom Paddock in a title fight, however he lost it on his first defence in which he fought against Jem Mace. Jem Mace (1861 – 1862) – Jem Mace (pictured below in the centre) toured the world with his boxing Booth taking on all comers, though he lost his title to Tom King after initially beating him in their first contest. Tom King (1862 – 1863) – King (pictured below on the right) gained the title after 21 rounds against Jem Mace, and then he became the second champion to retire after fighting John C Heenan after a hard fought two round battle. Jem Mace (1866 – 1871) – After originally gaining and losing the title as a bare knuckle boxer, Mace was one of the first high profile fighters to switch to using boxing gloves in the ring after the introduction of the Queensbury Rules. 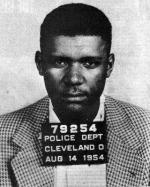 After his retirement, he continued to tour with his booth and became a successful promoter. Holland, B. [Internet]. 2008. History of London Boxing. The BBC. Available from: http://www.bbc.co.uk/london/content/articles/2007/11/13/early_boxing_history_feature.shtml [Accessed October 8, 2013]. Keating, F. [Internet]. 2010. Tom Cribb's bareknuckle deeds in the cradle of international sport. The Guardian. Available from: http://www.theguardian.com/sport/blog/2010/dec/15/bareknuckle-boxing-frank-keating [Accessed October 8, 2013]. Pursall, B. [Internet]. 2010. Jem Mace. Jemmacelifehistory.co.uk. Available from: http://www.jemmacelifehistory.co.uk/index.html [Accessed October 8, 2013].